There has been much news coverage in the last 24 hours about the just-released figures from the Congressional Budget Office regarding change in income for each economic group over the last 30 years. Basically, the top 1% of income-earners have seen their incomes grow 275% over that time, and everyone else has either seen only minimal gains (the top 20% or so) or completely stagnated (the bottom 80%). I have already seen numerous charts, graphics, blog entries, and opinions on the internet talking about this statistic–one of the most comprehensive seems to be here. Let me add one more to the mix. Nevertheless, it is an interesting and positive development how much coverage this issue is receiving at this moment, exactly when there is so much public and popular backlash about inequality, rapacious banks financing corrupt politicians, a general sense of injustice, and the rise of the Occupy Wall Street movement. It is also a bit ironic that this study was done at the behest of a bipartisan request of Congress, and was conducted by the non-partisan CBO. Given the results of the findings, it will only help to advance the Democratic platform, and weaken the Republican one. This does not follow automatically, but only because Democrats, by default, are the only party that supports anything like a progressive tax policy, whereas the Republicans have regressed from any earlier forms of progress they might have once embraced, however tentatively, in order to cling to what can only be described as “survival of the richest, and screw the rest.” I don’t think I am exaggerating, as I have been observing and trying to understand the political situation for some time, and can come to no other conclusion about the regressive intransigence of the Republicans. 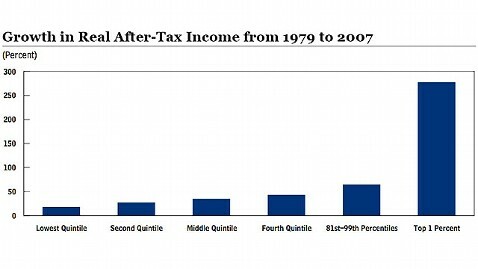 Is it important to understand the source of the growing inequality over the last 30 years? Yes, it can be considered a recent historical trend that did not develop in a vacuum. It also helps us to understand the current situation of our national financial system, deficit, budget, political system, etc. We must first consider that these figures are so alarming to many people not because of the percentage itself, but because of the overall progression of inequality. For example, we know that there has always been a huge disparity between ‘haves’ and ‘have nots’, and that the richest 1% took home a similar percentage of income even at the time before the Great Depression. Thanks to a series of regulations, union growth, and progressive taxation, the disparity between super-rich and everyone was gradually lessened throughout much of the 20th century. ‘Trust-busting’ of huge monopolies used to be enforced by the government, and companies were not allowed to become what we now call ‘too big to fail’. For several decades, the richest earners paid income taxes much higher than today, but this not only did not hinder their success, but it helped everyone else to prosper as well. So when did the trend of growing prosperity end and growing inequality reassert itself? The best (or at least simplest) answer is clear: the Reagan presidency. Multiple tax cuts for the top earners were coupled with an overall lessening of financial regulations, and refusal to enforce even existing regulations. All the charts and the figures involved clearly show the pattern of gross financial abuse of the system gaining considerable force during the Reagan years, while the simultaneous rejection of progressive policies on all accounts have led to stagnation for everyone else. I know that this is an over-simplication, but it remains true nonetheless. And during this time, the US has gone from being a sort of ‘beacon’ of freedom and equality, to a place that now ranks in the same sterling group of countries as Rwanda and Uganda–last in the world in income equality! So what does this mean? I admit that higher tax rates for millionaires will not cure all of our problems, and in fact, will do very little in the big scheme of things. But that is beside the point. Allowing the Bush tax cuts to expire next year would automatically set the highest tax rate back up to 39.6% from the 35% of the last 9 years. This is the first step in a series of symbolic, but meaningful, steps to adjust the role of government back towards the successful progressive role it maintained in the recent past. Taxing the rich directly is the most effective single way to mitigate inequality, provide more means of assistance to the bottom 20% in poverty, and make way for a more just society. I always thought Robin Hood was a popular character for all time because he did what is intuitive to us all–robbed the rich to feed the poor. The difference with these tax rates is that no one is getting ‘robbed’–the rich will hardly notice the difference, and the extra revenue will make a world of difference to supporting programs such as education that help even the poorest citizens to have more control over their own ability to rise out of poverty. A full two thirds of millionaires have no disagreement with this same argument, agreeing with Warren Buffett that the rich should, in fact, pay more taxes. There is obviously much to say and many vociferous disagreements on these issues, especially regarding the rival political philosophies of liberalism and libertarianism. I will discuss those points in a later post. The most basic thing we must ask ourselves, however, is what kind of society we want to live in…one in which everyone has a possibility to attain a prosperous existence, or one in which the richest minority writes it own rules at the expense of the majority.